Finnish violinist Sirkka-Liisa Kaakinen-Pilch provides us with a powerful account of Biber's masterpiece, bringing nobility, exuberance, severity and a strong contemplative dimension as and when the music requires. There is also a lively depictive element which she realises with vivid but restrained gestures (...). Here are performances which capture south German Baroque flamboyance on the one hand and a deeply reflective spirit on the other (...). An outstanding release. New Ondine release includes Heinrich Ignaz Franz Biber's (1644-1704) 16 Mystery Sonatas, also known as Rosary Sonatas. This set of virtuosic violin sonatas is Biber's most well-known work. They also serve as unique masterpieces of the Baroque violin repertoire. In the present recording violinist Sirkka-Liisa Kaakinen-Pilch is joined by the Finnish Baroque ensemble Battalia. 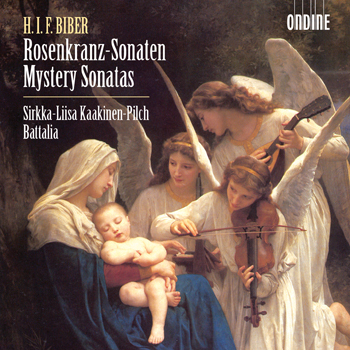 Biber's Mystery Sonatas feature 15 rosary mysteries from the life of Jesus and Virgin Mary. One of the most prominent characteristics of Biber's work is the use of various tunings, i.e. scordatura. Out of the sixteen sonatas, fourteen require the use of ‘mistuned' violin. Sirkka-Liisa Kaakinen-Pilch is nowadays in great demand as a leader of countless renowned early music ensembles and orchestras, performing music of the Baroque and symphonies of the age of Mozart and Schubert. Her solo repertoire includes works by Biber, Johann Sebastian Bach, and solo violin works of the 16th and 17th centuries. She also plays the viola and viola d'amore. Among her numerous tasks, she has also worked 10 years as the leader of Philippe Herreweghe's Collegium Vocale. Kaakinen-Pichl has also recorded a double-CD of Johann Sebastian Bach's solo violin sonatas and partitas for Ondine.